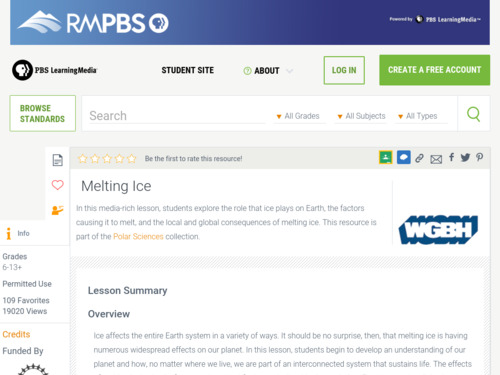 Given the number and variety of media resources linked from the activity, educators will need to select those that are most relevant to objectives of the the lesson and interests/grade level of students. Educators should be careful to not overload the students with information from the videos; it might be difficult for students to keep the information straight. For example, sea ice doesn't seem to be explicitly discussed in the lesson other than what is shown in the videos. Sea ice is mentioned in the melting ice in a glass experiment, but the connection should be drawn more clearly and the difference made explicit between the ice in the glass and sea ice. Excellent additional resource for most up-to-date information on Arctic Sea Ice: Arctic Report Card http://www.arctic.noaa.gov/reportcard. Many excellent media resources, most of them Quicktime videos, guide and support the activity. These resources are produced by credible institutions like NASA and NSIDC. Good overview of different types of ice. Use of videos and animations is very useful to show various concepts. Video of native populations is effective at showing impacts of changes. Many of the videos focus on the Arctic but lessons learned also apply to Antarctica. Videos might get out of date quickly, especially in regards to melting ice, where things are happening quickly. Be aware of this and check the most recent science facts. Comment from scientist: (specifically about part 1, #4):Glaciers are land ice, so the sentence isn't worded correctly. They may mean ice sheets: "like sea ice and ice sheets, glaciers are also melting." Basically, ice sheets need to be differentiated from glaciers and the point made that both are forms of land ice. Activity combines passive video clip watching, interactive discussions, hands-on activities, research, and reflection (poster presentation) components, which will help to engage students of different learning styles. This activity is technology heavy. Teachers need access to several computers in the classroom or ability for students to watch videos on their own. Some of the media resources listed may not be functional at time of use, but there are plenty of options from which to choose.